(Preliminary ParallelResearch Session categories for ORAL presentations, subject to change). Co-Authors: Gustav Dobos; Tatiana Overhamm; Arndt Büssing; ; Jost Langhorst; Sherko Kümmel; Anna Paul; Holger Cramer, Ph.D.
Presenting Author: Elio Giovanni Rossi, M.D. Authors: Ilaria Demori; Diego Lanaro; Antonella Strangio; Erika Iervasi; Luigi Ciullo; Daniele Saverino, Ph. D., M.D. 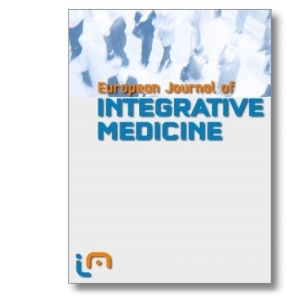 Presenting Author: Heidemarie Haller, MSc, Department of Internal and Integrative Medicine, Kliniken Essen Mitte, Faculty of Medicine, University of Duisburg-Essen, Germany. Presenting Author: Kaj Winther, MD, DMSci. Presenting Author: Christian S. Kessler, M.D. Co-Authors: M.A. ; Thomas Ostermann, Prof. Dr. ; Shivenarain Gupta, Prof. Dr. ; Elmar Stapelfeldt, M.A. ; Michaela Spoo; Antonio Morandi, Dr.; Mark Rosenberg; Andreas Michalsen, Prof. Dr. ; Claudia Witt, Prof. Dr.
Presenting Author: Thomas Ostermann, Prof. Dr.
Presenting Author: Shu-Ching Li, M.D. Co-Authors: Sung-Yen Huang, M.S. ; Man Ling Kao, M.D. Presenting Author: Hanne Mette Ridder, Ph.D.
Keynote: Integrative Medicine and Ethnopharmacology: Common Needs and Different Approaches? Institution: Department of Pharmaceutical Biology, Institute of Pharmacy and Biochemistry, Johannes Gutenberg University, Staudinger Weg 5, 55128 Mainz GERMANY.